This is a modified recipe I found on the Weight Watchers website. I made my version gluten-free and added a little something. The result was a very tasty recipe that was very easy and didn’t take long to make. Cook rigatoni in salted water according to package directions; drain. Meanwhile, cook sausage in a large nonstick skillet over medium heat, breaking up sausage as it cooks, about 3 minutes. Add kale; cook, stirring frequently, until limp, about 3 to 5 minutes. Add broth to skillet and scrape up browned bits on bottom of skillet with a wooden spoon; season with salt and pepper and add tomato puree. Cover skillet and reduce heat to low; cook until kale is tender, about 5 to 10 minutes. 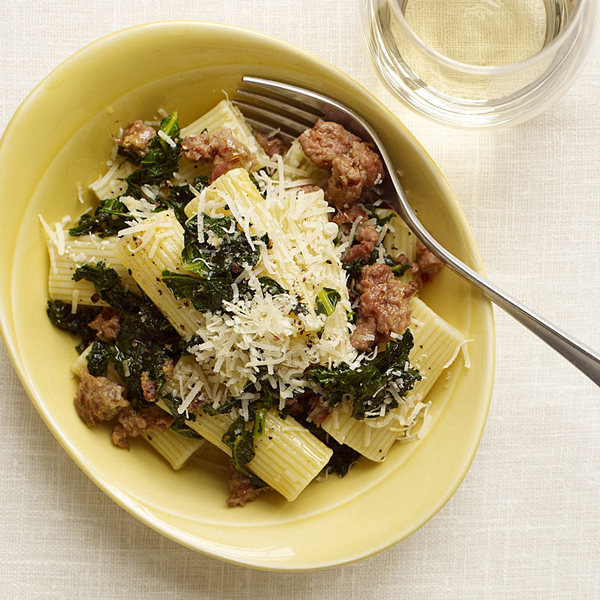 Stir in rigatoni; heat through. Sprinkle each serving with about 2 tablespoons of cheese before serving. Yields about 1 1/2 cups per serving.